Dreamiest at 12 months old. "Dreamee" is the first Champion from our Ch. 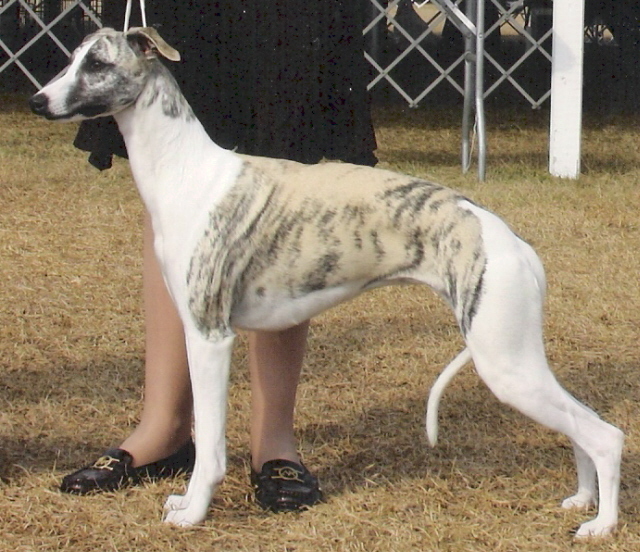 Karasar's Artistry's (NUMBER ONE Whippet for 2008, AKC ALL SYSTEMS) first litter. Her sire is Intl, Jap. & Am. Ch. Karasar's Jester (NUMBER ONE Whippet in Japan for 2009) With TWO Parents as Number ONE Whippets she has a promising future! Pictured here at 12 months old, she finished her Championship AT 12 Months old, exclusively from the Bred by Exhibitor class with wins over TWO Different Best in Show winning champions. "Dreamee" is very REMINISCENT of her Top producing grandmother MBIS Ch. Karasar's Reminiscent ROM. A personal favorite of her breeder, we believe she has great potential as a show dog and producer with her outstanding pedigree.